The revised fee structure would result in the denial of opportunities to students from poor economic and social background, the agitators claim. 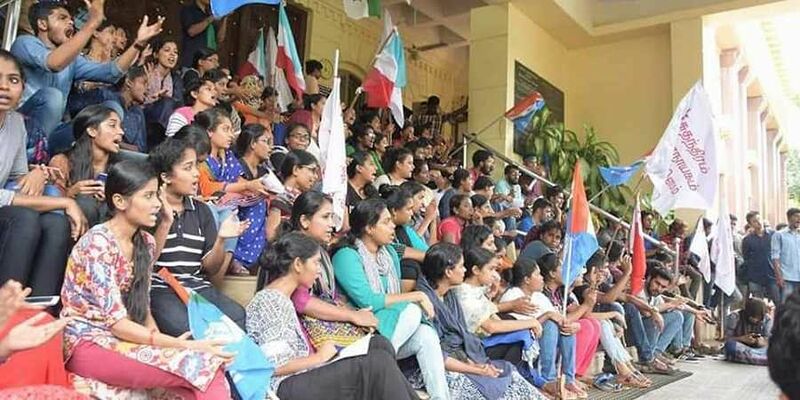 Six students organisations along with the Pondicherry University Students Council have formed a Joint Action Council (JAC) to resist the decision of varsity administration to implement a steep fee hike in various departments. Raising the slogan "Affordable, Accessible, Equal Education for all", the students will launch a strike if their demands are not met, JAC members said. The council has also put forth other demands including 25 per cent reservation for students from Pondicherry, re-implementation of semester exam system and accommodation of local SC/ST students in the varsity hostels. Earlier this month PU had increased the fees for their MBA courses by a whopping 125 per cent — triggering widespread protests. The Students Council and the SFI unit had released circulars demanding a withdrawal of the decision. 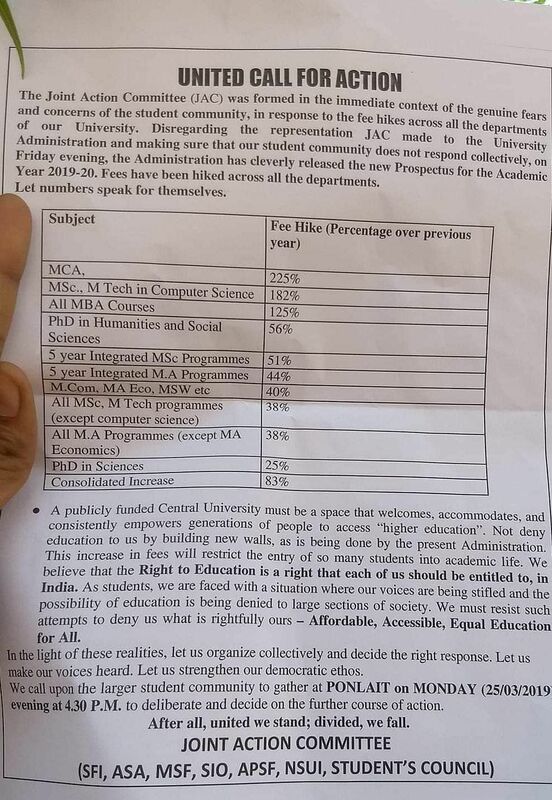 However, the JAC claims that the varsity has now gone to the extent of increasing the fee for MCA by 225 per cent and MSC/MTech Computer Science by 182 per cent. "The JAC was formed following an all-party meet since the authority showed no sign of the fee rollback. A memo citing all our demands was submitted to the offices of the Registrar, VC and Dean of school of management on Friday. We will organise a march tomorrow before meeting with the authorities to know their decision and will launch a strike if a response favourable to the students is not received," SFI unit secretary Abhijeet Sudhakaran informed Express on Sunday. The revised fee structure would deny opportunities to students from poor economic and social background. The public-funded Central University should uphold the Right to Education guaranteed to all Indians citizens, the students said. Another demand put forth by the JAC is to allocate university hostel rooms to the SC/ST students residing in the Adi-Dravida hostel. This is affecting the students' after-class activities and college life altogether, they claim. "SC/ST students travelling a distance less than 50 km from the campus are allotted rooms in the state-run welfare hostels instead of the campus hostels which have better facilities. Why should they live in those rooms with limited facilities while the better-equipped varsity hostels could easily accommodate them," asks MSF unit President Saithu Mohammed. The JAC has asked the students to gather at the campus 'PONLAIT' at 4:30 PM tomorrow to decide on the further course of action. The ASA, APSF, NSUI and SIO are the other participating students organisations of the council. It was jointly decided not to invite the ABVP to join the committee. A similar action council was formed in September last year following which an indefinite strike was launched. The two-day agitation was called off as the varsity Vice-Chancellor agreed to all their demands including authorising of peacefully-organised protests on the campus.